A4 Video Converter help you convert your favorite video files into video clips, audio files and image files or capture video clips from your capture device. 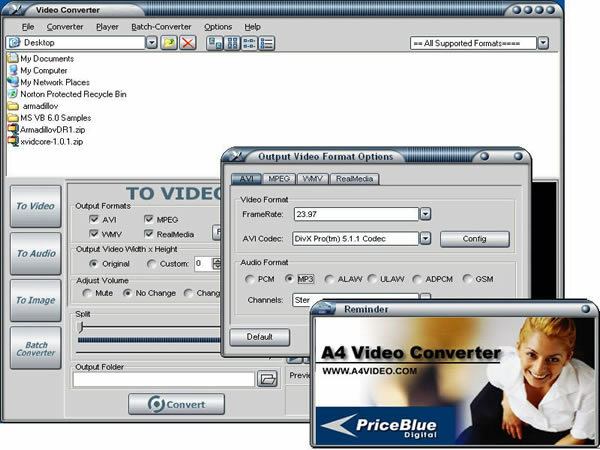 A4 Video Converter - With a very easy to use interface A4 Video Converter can convert video formats, extract audio from video files and extract images from video files or captured video clips. It also supports splitting video files and extracting audio and images from any appointed part of video file and merge several video files into a single video file or audio file. Most features are supported such as fast batch conversion, capturing video clips, file browser embedded, drag-drop to load or add video files, conversion with volume adjusting and width*height adjusting, full conversion options and more! RM (Real Networks Video, convert to only). VOX (Dialogic ADPCM), MPC (MusicPack). Audio DVD Creator - Creat Audio DVD easily with Auido DVD Maker. A4 DVD Copy - Copy DVD movie to DVD without any lost.